Update: The Wallaroo has been renamed the Wallaby. For posterity’s sake, we will be leaving this sneak preview the way it is. But our final, in-depth review will be of the Wallaby. The Wallaroo is a new sit stand workstation from Ergo Desktop, makers of the Kangaroo Desktop Riser, which had previously been our experts’ choice in the sit stand workstation category. In the wild, a Wallaroo portmanteau of “Wallaby” and “Kangaroo”, and – in addition to being an actual animal – is also a sort of middle step between the fully-adjustable Kangaroo and the more feature-bare Wallaby. We are currently evaluating the Wallaroo in our testing lab. While a more comprehensive review of the Wallaroo will be out soon, here’s what we can tell you now about this new riser. A quick scan of Ergo Desktop’s product line reveals that the Wallaby – their lowest-cost model– is nowhere to be found. A quick call to our Ergo Desktop rep confirmed our hunch: the Wallaby is being phased out, to be replaced by the Wallaroo. A good idea, in our opinion. The Wallaby has been an affordable sit-stand option, but, lacking the monitor mount of its more robust Kangaroo sibling, it requires users to place their monitors directly on the work surface. This poses two problems. First, it limits the amount of space you have available for keyboards and mice. The Wallaby has a published work surface depth of 24″, but your monitor would normally take up about 6″ of that depth. Furthermore, the fact that your monitor would be so close to the typing surface makes puts users in an uncomfortable posture. Craning your neck down and bending your wrists in a “T-Rex” posture is a recipe for ergonomic disaster. With the Wallaroo, Ergo Desktop has improved on the Wallaby design by adding a monitor mount to the central column. Attach a VESA-compatible monitor to the mount, set it to your desired height, and lock it in place. Unlike the Kangaroo, which has an independently adjustable monitor, the Wallaroo’s monitor mount can only move in unison with the work surface. Once set, your monitor’s position is more or less permanently set in relationship to the riser’s work surface. The Wallaroo isn’t the only riser out there with a fixed-position monitor. The Taskmate Go, the Winston Workstation, and (for the most part) the One-touch Free Stand all lack an easily and independently adjustable monitor mount. While not the most crucial aspect of a sit-stand workstation, we recommend that users have the ability to change their monitor height when switching from sitting to standing. In our testing we found that when switching between sitting and standing, many users need to readjust their monitors, if only by a small amount. A number of factors – the user’s keyboard angle, desk height, chair height, as well as natural posture – determine how much of an adjustment is needed. 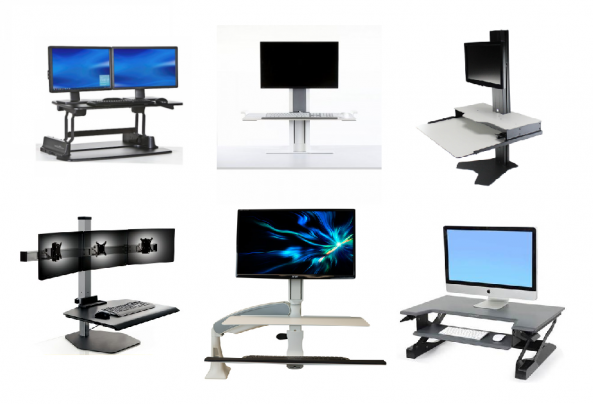 Adjustable monitor mounts help ensure that users are always working at an ergonomically-sound position. Apart from the lack of monitor adjustment, the Wallaroo’s other features line up along the lines of the Kangaroo. It has the same 24″x28″ work surface, and also secures to the desk top with a freestanding base – no clamping necessary. For stability, the Wallaroo comes with the same stabilization leg as the Kangaroo – it’s not pretty, but work surface stability won’t be a concern with it in place. The Wallaroo has the same 34lb weight limit and 16.5″ height adjustment range. Like the Kangaroo, it relies on tightening a knob on the central column to to keep the work surface in place. It’s an inconvenient aspect of the Wallaroo – especially next to the Winston’s elegant brake lever – but at least it securely holds your work surface at the correct height. Users can further customize their work surface with a keyboard extension or attachable side work surfaces, for a maximum width of 55″ and a max depth of 33″. While many risers can cost more than $500, the Wallaroo comes at a cool $349 ($279 for the junior model, which has a smaller 24″x18″ work surface). This puts the Wallaroo on the same price tier as the Varidesk, though its improved monitor ergonomics give the Wallaroo even more value. At the time of this writing, the Wallaroo ships out in 1-2 weeks, and at no additional cost. For $19 you can have your Wallarroo shipped pre-assembled and ready to use right out of the box. Like the other ‘Roo, Wallaroo comes with a solid warranty: 2 years on the gas springs and moving parts and 5 years on the steel frame. Our team of experts is currently evaluating the Wallaroo. Stay tuned for the complete review by signing up for our monthly online newsletter. There, you can stay up to date on the latest product reviews and ergonomics articles. For more information on the Wallaroo and other desktop sit stand workstations, see our Sit Stand Workstation Comparison Review.